No one could have predicted that, in the space of a few months, the death by self-immolation of Mohamed Bouazizi, a 26-year-old Tunisian struggling to make a living as a fruit vendor, would have sent such shock waves across the Arab world. That single act of desperation has led to the toppling of dictators, unleashed demands for political freedom and left autocratic rulers struggling to hold back the democratic tide. It also captured the sense of humiliation, hopelessness and resentment experienced by millions of young Arabs. Education failures are deeply implicated in the Arab world’s political crisis. Governments across the Middle East and North Africa have invested heavily in education, and the past decade has witnessed a rapid expansion of primary, secondary and tertiary education. Yet the results have been disappointing. Schools and universities are turning out graduates lacking the skills they need to succeed in employment markets, and the employment market itself is hamstrung by economic mismanagement. The result: high levels of education with mass unemployment. The political shock waves spreading across the Middle East and North Africa are rooted in problems that vary across countries. Yet three factors stand out. Politics across the region are being transformed by a demographic revolution, thwarted expectation and a popular reaction against autocratic regimes that combine unaccountable politics with failed economic policies. The power of demography should not be underestimated. The Arab world has the mother of all “youth bulges”. Nearly one in five people – around 85 million in total – are aged 15 to 24. Over half are less than 25. As the region’s leaders are discovering, demography can have profoundly important social, political and economic consequences. For countries with a young population, the immediate challenge is to generate the skills and economic opportunities that bring hope of employment, security and rising living standards. That hope was denied to Mohamed Bouazizi. And it is missing in the lives of millions of young people across the Middle East and North Africa. This is the region with the world’s highest youth unemployment rate. One in four young people are out of work. In Tunisia the youth unemployment rate is 31%; in Egypt it is 34%. Not only is joblessness rife, but young people also have to wait an exceptionally long time before finding their first job. Economists have even coined a term for the lengthy transition from education to work – ‘the waithood’. The average delay amounts to three years in Morocco and Iran, and over two years in Egypt. These delays are a source of deep frustration. Unable to secure economic independence and the social status that comes with employment, young people are forced to delay marrying, forming their own families and buying homes. Looking beyond the social consequences of youth unemployment, there is an immense economic cost. One estimate for the Middle East and North Africa puts the cost at 6% of GDP – more than governments spend on education. You can question the methodology behind the figure. But the high levels of economic waste associated with mass youth unemployment are beyond dispute. Behind the headline unemployment data there are some worrying patterns. Many Arab states have combined high economic growth with low levels of youth employment creation. For example, Jordan has been growing at over 6% a year without registering a significant cut in youth unemployment. The same pattern of jobless growth for young people is evident in other countries – and it could be about to get worse. Young people in the Middle East have been “missed by the boom, and hurt by the bust.” Youth are often last in line for new jobs, because the jobs are being filled by migrant workers, and because the growth sectors are often capital-intensive rather than labor-intensive. Gender inequality in labor markets is another barrier to opportunity: unemployment rates for female youth are 50% higher on average than for males. The corollary of failed job-creation in the formal sector is the growth of the informal sector. In Egypt, more than 70% of first time labor-market entrants were forced into informal employment, where they face low pay, instability and limited job security. This has far-reaching consequences. Once young people enter the poor quality job market they seldom escape its gravitational pull, partly because they are unable to generate new skills. Education is a key ingredient of the political crisis facing Arab states. Superficially, the education profile of the region is starting to resemble that of East Asia. The past two decades have witnessed dramatic advances in primary and secondary school enrollment, with a step-increase in tertiary education. Many governments have increased public spending on education. The 7% of GDP that Tunisia invests in the sector puts the country near the top of the global league table for financial effort. So what has gone wrong? Why has so much education and public investment failed to create a virtuous cycle of economic growth, employment creation and expanded youth opportunity? The answers to these questions vary across countries. But three related factors stand out. The first is a chronic misalignment of the education system and employment markets. In most countries, more education means less risk of unemployment. Not in the Middle East and North Africa, especially if you happen to be an educated female. In Egypt, the education group most likely to be unemployed is university level and above, followed by post-secondary. Around one quarter of the country’s male university graduates are unemployed, and almost half of its female graduates. No prizes for guessing why university graduates featured so prominently as leaders of the youth groups on Tahrir Square. Good old-fashioned economic mismanagement certainly contributes to failures of job creation. Much of the growth in the Middle East can be traced to high oil prices and property price booms. Governments across the region have shown limited interest in promoting entrepreneurial activity. Small firms in particular have been stifled by high taxes, corruption and the heavy hand of bureaucracy. Most countries lack even the semblance of a credible strategy for linking skills development in education to the promotion of new growth sectors – one of the keys to the economic success of countries like Singapore. The stark inequality on display across the Arab states bears testimony to economic policies that have made tiny elites fabulously wealthy while leaving the vast majority behind, and the region’s youth facing mass unemployment and insecurity. Leaders of many Arab states have a strong record of achievement in building up personal wealth. If reports of the assets accumulated by Zine El Abidine Ben Ali and Hosni Mubarak are halfway accurate, these are regimes that have systematically exploited public office on a massive scale. The Arab states urgently need a reform agenda that combines a commitment to social justice and reduced inequality with measures that create demand for employment. But they also need measures to address the second factor implicated in the misalignment of education and employment – the supply of young people entering labour markets with relevant skills. In an increasingly knowledge-based global economy, that means building basic competencies and the flexible skills associated with problem-solving. For all the expansion of access and investment in education, the Arab states have some of the world’s worst performing education systems. The problems start early. In this year’s Global Monitoring Report we carry a table showing the distribution of performance across different countries in reading test scores at grade 4. In Kuwait, Qatar and Morocco, over 90% of students scored below the lowest benchmark, indicating that they lacked even basic comprehension. In fact, these countries held the bottom three positions in a group of 37 countries covered. 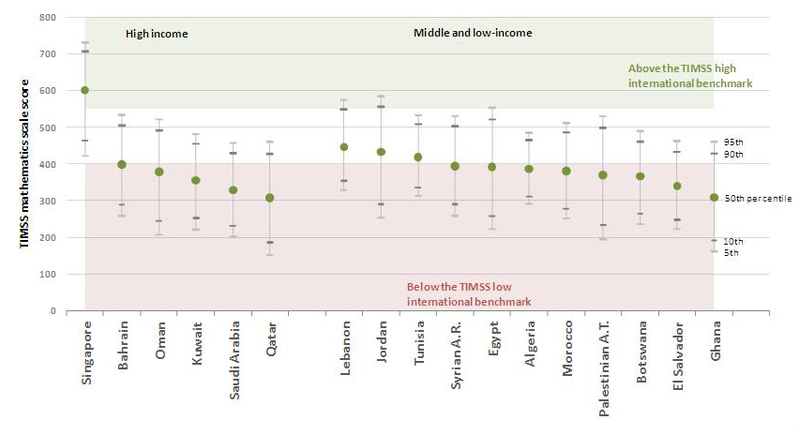 The median (or middle-performing) student in Algeria, Egypt and Syria scores below the low-benchmark; in Tunisia they score just above. In other words, half of the students in each country have gone through eight years of school to arrive at a level that leaves them with no working knowledge of basic math. In Saudi Arabia and Qatar, over 80% of students fall below the low benchmark. The median student in both performs at around the same level as their counterpart in Ghana and El Salvador – and Qatar is the worst performing country covered in the survey. Why are education systems in the Middle East and North Africa performing so badly? In many countries, teachers are poorly trained – and teaching is regarded as a low-status, last-resort source of employment for entrants to the civil service. There is an emphasis on rote learning, rather than solving problems and developing more flexible skills. And education systems are geared towards a public sector job market that is shrinking, and for entry to post-secondary education. Most don’t make it. And those who do emerge with skills that are largely irrelevant to the needs of employers. The problem of youth unemployment is not just that there are insufficient jobs – it is that potential employers are unable to recruit school-leavers and graduates with relevant skills. This is a point that has been well made by the Arab Employment Forum, among others. Failures in the education systems are, of course, related to wider failures. Across the Arab states, education providers are largely unresponsive to the needs and concerns of school and college students. Policymakers often reflect the limited accountability of the governments they serve. Moreover, many Arab youth view their education systems not as a source of learning and opportunity, but as a vehicle through which autocratic rulers seek to limit critical thinking, undermine freedom of speech and reinforce their political control. I discovered the depth of feeling on this issue in a recent BBC Doha Debate with the brilliant and (regrettably if you are on the other side of the debating table) very eloquent Oxford University professor Tariq Ramadan. The third factor that has to be addressed is one that has been gravely neglected in the coverage of the current crisis. To a large extent, the protest movement across the Arab States has been led by educated youth and adults frustrated by political autocracy and limited economic opportunity. This has deflected attention from an education crisis facing low-income households in primary education – and from the needs of adolescents and youth emerging from school systems with just a few years of sub-standard education. 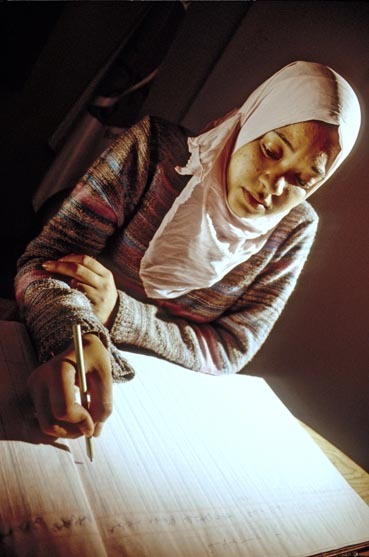 The Arab states have an unfinished agenda on basic education. They still have 6 million primary school age children out of school – around 9% of the world’s total. Despite the vast gap in wealth between the two countries, Saudi Arabia has a lower primary school enrolment rate than Zambia. The Arab world also has some very large gender disparities: in Yemen, primary school enrolment rates are 79% for boys, but just 66% for girls. National average indicators can sometimes obscure marked disparities in education opportunity. Consider the case of Egypt. On average, someone aged 17-22 years old in the country has had around nine years of education. That’s roughly what might be anticipated on the basis of the country’s income. Scratch the surface, though, and you get a different picture: around 12% of Egyptians have had less than two years of education. 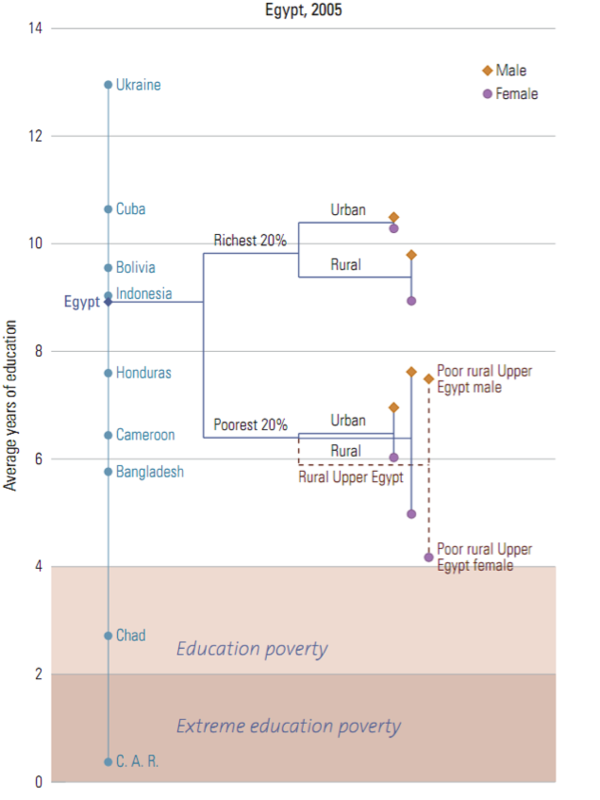 The Deprivation and Marginalisation in Education measure that we developed for the 2010 Global Monitoring Report provides an insight into the sources of education inequality in Egypt (left). You’ll see from the attached link, being poor, being female and living in rural Upper Egypt carries very large, and mutually reinforcing disadvantages in education. Over one-quarter of girls from the poorest 20% of households have less than four years in school; and nearly half have less than four years. High dropout rates from primary and lower secondary school are symptomatic of parental poverty, poor quality education, and a sustained failure on the part of the Egyptian government to tackle the underlying causes of inequality. Adolescents from poor backgrounds entering labor markets without a secondary education are carrying a one-way ticket to a life of poverty, insecurity and marginalization. They do not figure prominently in unemployment data for a very simple reason: they cannot afford to search for jobs, and they cannot fall back on family support. This helps to explain the apparent paradox of near full employment among illiterate youth and people with no more than an elementary education. The political crisis sweeping Arab states is the product of many years of political failure. The aspirations and hopes of young people – who are increasingly connected to each other and the outside world through the Internet – are colliding with an atrophied political system governed by complacent, self-interested elites who are disconnected from the population. Autocracy and bureaucracy have combined to create a generation of youth lacking hope for a better future. Yet in every crisis there is an opportunity. Youth and children are an asset. The political challenge is to harness that asset through democratic reform and an agenda for education and employment. Rulers who fail to respond to that challenge face the prospect of being swept from power – and rightly so. This entry was posted in Basic education, Democracy, Developing countries, Governance, Marginalization, Millennium Development Goals, Out-of-school children, Primary school, Secondary school. Bookmark the permalink. We agree with your article to some degree but feel you have you educationalised a problem which is fundamentally a political one. People across the Arab world are protesting because they have had enough of living in fear and without basic human rights. This is not an educational problem. Indeed, you could argue that by acting as a diversion – with the promise of a better life for those who study – education has allowed repressive regimes to survive as long as they have rather than, as you seem to be suggesting, actually bringing about the crises. If education has played any direct role in recent events, it has been self-education at most. Social networking sites and internet vidoes have drawn public attention to political corruption violence and repression. Their education systems have singularly failed to do this. Pingback: Syria Comment » Archives » The Revolutions – What do They Mean? When you see mobs of people in the streets protesting their governments, how many gray hairs do you see? Little or none. Street protests are the activities of the young. Young people who are saying, “I’ve been educated. I’m as good as you are. I will no longer be held down. I want a job and I demand my civil rights!” This was the case with the civil rights movement in the United States, and is the motivation of the “Arab Spring”. The Middle East has increased young people’s educations but not provided them with jobs and a better economic life. It is especially true with women. Once you educate people, you can’t hold them back. Arab Spring is the youth of the Middle East demanding a right to enter the 21st Century and in the end, they will not be denied. It amazes me that despite the number of growing schools, education lacks even more. Political issues facing this country are not new. I did not realize how negatively it impacted the educational system. Is there a change for this educational system in the near future? I find it amazing too. It’s not just in middle eat. Even in Africa too. I just hope that in the future some actions will be taking towards such issues. Sir g I have a question why the Islamic poor peoples leave the education between the graduation….